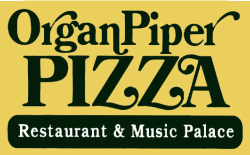 Organ Piper Pizza has featured live theatre pipe organ music continuously since it opened in 1976. However, the "Mighty Wurlitzer" theatre pipe organ actually dates back to the 1920's. Click Here for more about the history of the theatre pipe organ. Our Mighty Wurlitzer has no amplifiers, and no speakers, only wind-blown pipes and real pneumatically operated percussions, all operated by the organist! While this is a pipe organ, it's vastly different from a classical, or church, pipe organ. Think of it as a symphony orchestra at one person's fingertips! Our organists take requests and can play a variety of songs, from Bach to rock, to the latest disney tune!